The live video streaming app that was set up by Kayvon Beykpour and Joe Bernstein was purchased by Twitter in March 2015 and can now be accessed in both the Apple app store and Android store. The concept is remarkably straightforward for the advanced technology it offers; a quick log in via your regular Twitter account means seconds later you can broadcast live video to the world and gather hundreds of views from anyone who stumbles across your stream (you can of course also stream to an exclusive group of viewers.) Viewers can then ask questions or comment during a live Periscope, making a great platform for small businesses wanting to showcase their product or services and to instantaneously gather opinions from the general public. I downloaded the app to see what all the fuss was about and I have to admit I became pretty addicted as soon as I felt the adrenaline rush of going live and subsequently being virtually showered in the little love hearts which being to float around in the video as viewers enthusiastically tap away at the screen to display their kudos for my live stream. Since its arrival to our screens, Periscope has become increasingly popular with businesses and significant individuals, and one field that it has taken off in is video journalism. Only recently a news report stated how journalists were using Periscope to report on the current refugee crisis, allowing journalists to report in real time from their very own phones. Periscope is not just for self promotion but also for media consumption by following your favourite media groups or trade shows e.g. IBC or NAB, one in which I will definitely be using Periscope for next year! One company that used Periscope to their advantage was energy drink power house Red Bull. They streamed their Red Bull Guest House event in March and judging by the response it was a hit! 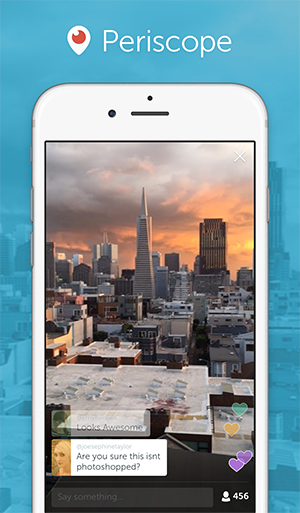 Keeping up to date with big news is fantastic with Periscope and allows users to be apart of the experience as they can comment and ask questions during live Periscopes. So how do you know if you have been a hit on Periscope? Well here is the simple lowdown.. its all about the hearts! Yes thats right, the more hearts that appear in your video means the engagement with users is high. Improving your own brand or business can be achieved through Periscope, as using Q&A sessions is a very popular method that many are using through Periscope sessions, penetrating a new demographic or audience is way to do this, and with the global attention you will receive, this can be a pocket friendly way of finding new fans. So now you know all you need to know about Periscope, try it out by downloading it from either your Apple app or Android app store! So how can Periscope help you and what can you gain? Terry White, a certified Adobe expert with over 19 years of experience, discusses his views on the live streaming app as he recently shared his own Periscope video via his YouTube channel. What are your thoughts on Periscope? I love Periscope because it enables ordinary people to be able to instantly broadcast live video and audio. How easy have you found it to use Periscope? Periscope is very easy to use and get started with. How beneficial to small businesses do you think Periscope is? Ive seen small and large businesses begin to embrace Periscope as a way of talking directly with existing and new customers and even use it to launch new products. Has Periscope helped you and if so, how? Yes, its given me one more way to talk to my fans at any time day or night and from anywhere in the world. If you could make any adjustments or improvements to Periscope what would they be? Periscope is great but there are lots of things Id like to see. A few features that come to mind are: the ability to save broadcasts longer than 24 hours (maybe that becomes a paid aspect of Periscope). The ability to save the broadcasts with the comments and hearts directly to your device. As it stands today it will only save the video/audio. The ability to bring other broadcasters into your stream ("Now lets hear from Joe on the other side of the convention hall") and when that person is done, I take control and it comes back to me. In terms of those using it for video production purposes how can users take advantage of the app? For video production it useful to do a broadcast and get the live feedback, but once youre done take the raw video thats now on your device and repurpose it.